Lending a Kindle book isn’t nearly as easy as lending a good old-fashioned paper book, but it can be done—provided you’re willing to jump through a few hoops. Among the hoops: some publishers won’t let you lend certain Kindle books at all, while others will only let you lend a book once, and for only two weeks. So, ready to start lending? See the “Loan this title” link under the “Actions” menu? If so, you’re in luck. Your first step is to see which of the books in your Kindle library are, in fact, lendable. Go to Amazon.com, click the “Your Digital Orders” link in the top-right corner of the page, then click the “Your Kindle Orders” link. You should now see a list of all the Kindle books you’ve purchased. You can sort by the date, title, author, or date purchased. For each book, you’ll also see a button labeled “actions”. Hover your mouse over the button until the menu appears. Now, does “Loan this title” appear in the menu? If so, click the link to start the lending process. If not, that means the publisher of your Kindle book doesn’t want anyone borrowing it. Sorry! Once you’ve clicked the “Loan this title” link, you’ll arrive on a page with the publisher’s conditions for lending the book. Typically, you’ll only be able to lend a book once, and only once. Also, the borrower usually must return the book after 14 days. If you’re OK with the lending conditions, you’ll need to fill in a web form with the borrower’s details—just a name and e-mail address will do. Also, keep in mind that your lucky friend doesn’t need a Kindle to borrow a Kindle book from you. All done filling out the form? Click the “Send now” button. Your friend will have seven days to accept the loaned book—and once she does, you won’t be able to read the borrowed book until she returns it. If a week passes and your friends doesn’t claim the book, it’ll be automatically returned to you. 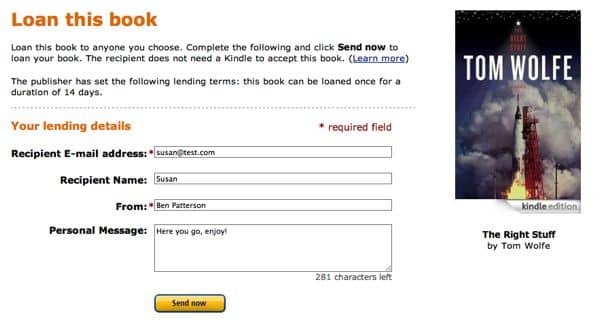 Want to find out whether you can lend a Kindle book before you purchase it? According to Amazon, you can check by scrolling down to the “Product Details” section on any Kindle book page in Amazon’s Kindle Store; if you find a note that reads “Lending: Enabled,” then you’re all set to lend. 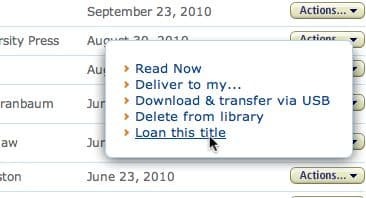 In my experience, though, that “Lending” note is sometimes missing from “Product Details” section for Kindle books that you can, in fact, lend to someone else. Odd—and annoying. So, quick show of hands: do you think it’s fair for book publishers to only allow Kindle customers to lend out their ebooks only once per volume? Don’t forget: you can also borrow Kindle books from your public library, or from Amazon itself if you’re an Amazon “Prime” member.